From the record sleeve this looks like the shop may have been operating during the early post-World War 2 years. They advertise themselves as selling Radios and Cycles. The Infirmary Road address may be the original building but is now part of a larger cheapo furniture shop. The Firth Park Road address was still Allen’s Cycles in 1965, but is now a chemist. 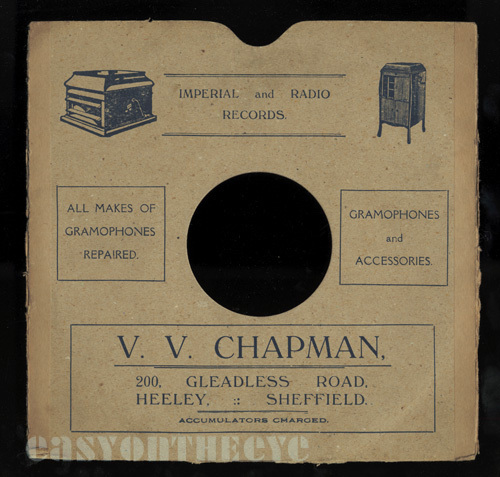 “We Are Out To Satisfy You”; the sleeves advertise Gramophone Records, Gramophone Players and repairs. 277 was later a record shop owned by A. Wood (see separate entry). 102 has been demolished and replaced by modern building, 277 premises survive but has been converted into a house. 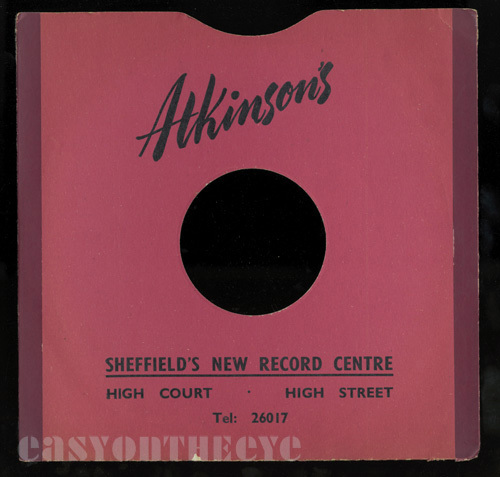 Atkinsons sold 78s during the pre and post war period in their department store on The Moor but opened a separate record shop “Sheffield’s New Record Centre” for a time in the 1950s selling the new format records. I don’t know when this was opened or closed. The Moor store was bombed in the war and rebuilt. Sheffield’s best known and biggest suburban department store built in 1933, Banners dominated the East End of the City. 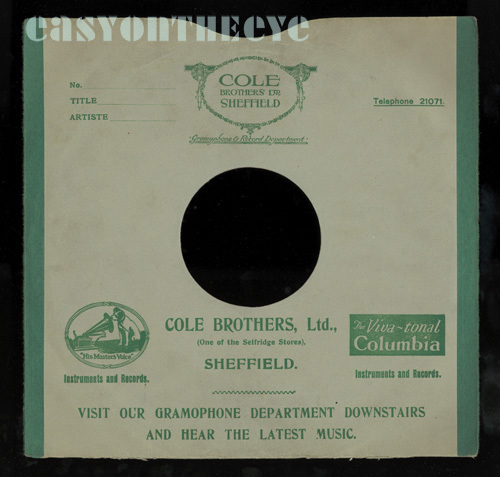 The purpose built shop had several floors, the first working lift, and of course a record department selling 78s. Magnificent building survives albeit as a poorly organised set of cheap rental spaces and deserves far better. 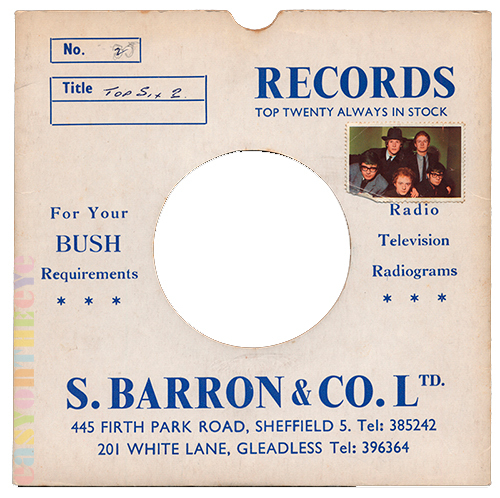 Probably a modest radio and TV shop, but they had two branches and sold 7″ singles in the 1960s. Card sleeves printed. “Top Twenty Always In Stock”. 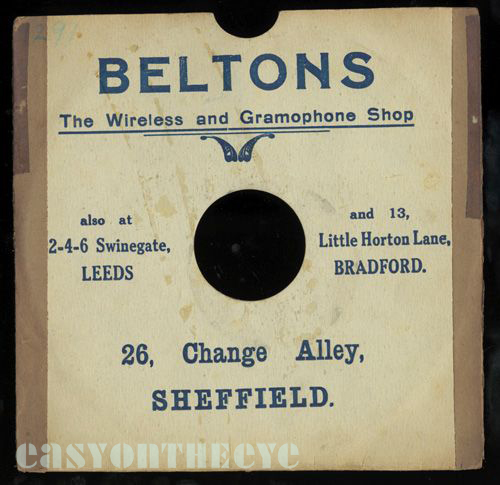 “The Wireless and Gramophone Shop.” Beltons also had branches at Leeds and Bradford. 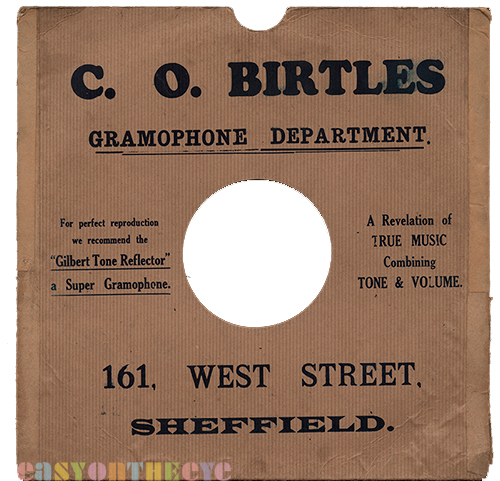 They must have been selling records quite early on as they did 8″ discs which were discontinued C1910. Change Alley demolished during building of Arundel Gate. 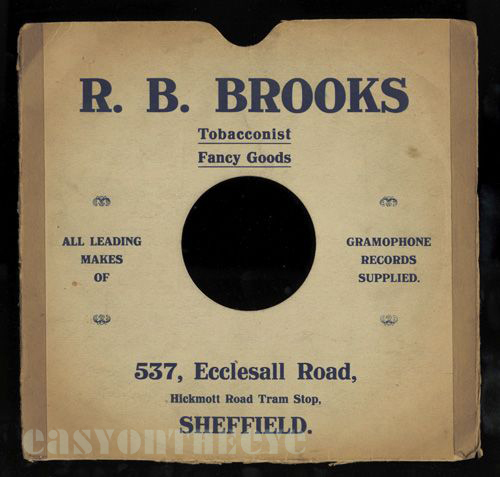 I only have a blank 78 rpm sleeve with this firm’s name and details rubber stamped onto it. I would imagine it dates from the 1920s or earlier. The building is still there but looks like it a Victorian office block so maybe Bennett’s ran it inside somewhere. Birtles, C. O. 161 West Street. Later 177 West Street / 559 Attercliffe Road. 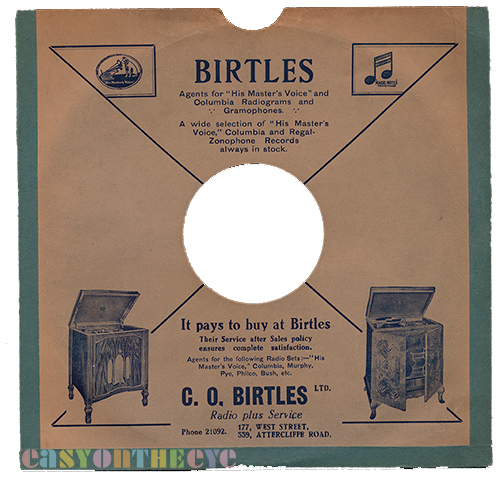 “It pays to buy at Birtles” . Earlier bag has 161 West Street address, then they appear to have moved on to 177 and opened another branch in Attercliffe. 161 West Street destroyed recently for another block of student slum flats. 177 has been destroyed recently for a badly designed student bar complex. Sheffield Council want whipping for allowing this handsome Georgian row to be butchered. 559 Attercliffe Road is still there but now reduced to a shabby “adult” store called Fantasy Locker. “Everything For Home Comfort”. This was a local department shop originally opposite Royal Infirmary according to their sleeves (but which seems to have moved post-war due to bombing). 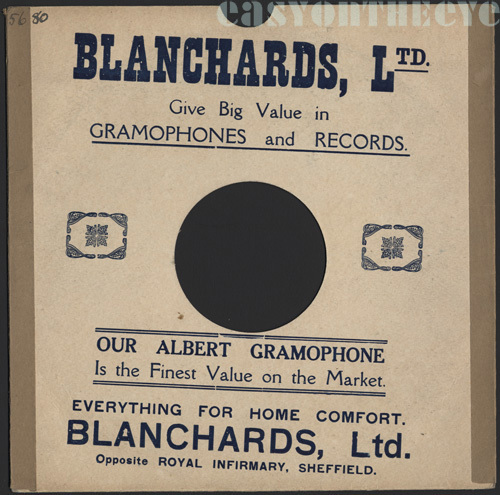 They stocked Gramophone Records (78s) and Gramophone Players (‘our Albert gramophone’) for a time. 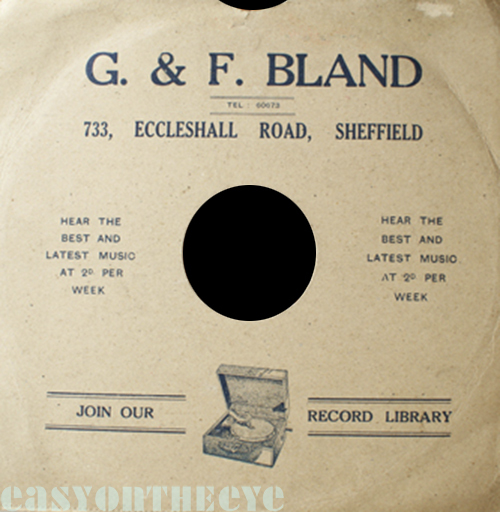 This 78 sleeve suggests Bland’s were a record library, and for 2d per week you could loan the latest records. This (and similar book lending services) went out of fashion once the city began opening public libraries. 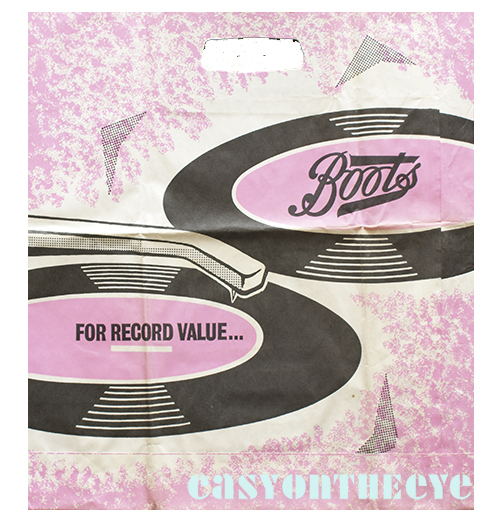 Although Boots The Chemists are a nationwide chain, some of their bigger stores sold records in the 1960s and 1970s, as well as accessories like plastic sleeves and storage bags. They did quite a good range of albums and single. 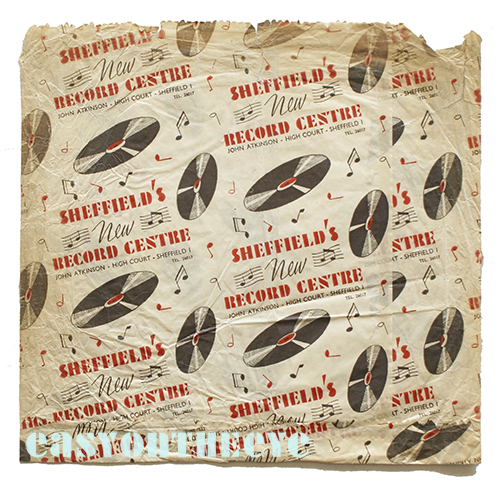 I’ve not seen a Sheffield specific bag but the one here from the 60s was probably used throughout the country. They may have had more shops in Sheffield (and also opened in Rochdale, Huddersfield, Manchester and Doncaster). I don’t know when the chain started, but probably a late-comer to the scene emerging in the 1960s. They peaked in the 1970s and faded sometime in the 1980s. There is more on the Sheffield shop on the site. 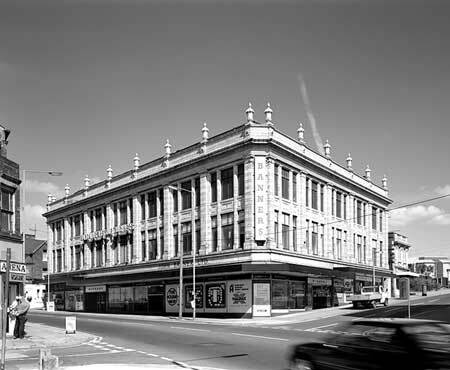 British Home Stores, 43-51 The Moor. BHS (as we know them today) was founded in 1928 and is a nationwide chain. Back in the day they also sold 78s, sheet music and needles. Their shop was on The Moor, and after the area was bombed in the war they rebuilt. Not certain of the date of this bag, maybe late 1930s? This was a general shop, advertising “Tobacconist, fancy goods, all leading makes of gramophone records (78s) supplied” on their sleeve. People were advised to use the “Hickmott Road tram stop.” The premises survive, now a restaurant. Cann, Philip 2 & 4 Dixon Lane. 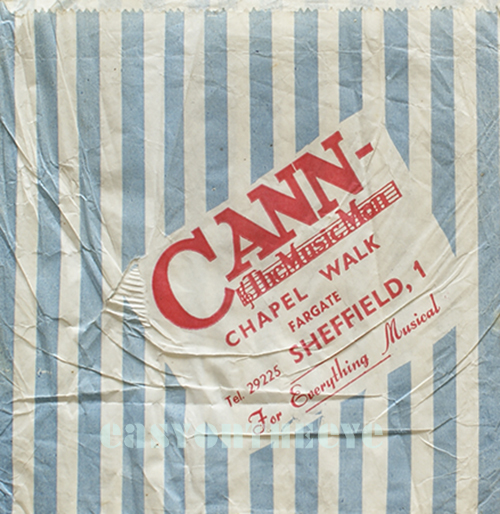 “For Everything Musical – Most Complete Record Stock In Yorkshire”, Cann’s (as they were always known) were one of the city’s best stocked music shops selling music, instruments, as well as gramophone records and players. Listed in directory as early as 1927 but had been there possibly since late 1800s. Premises demolished in 1960s (they moved – see below) and site redeveloped. 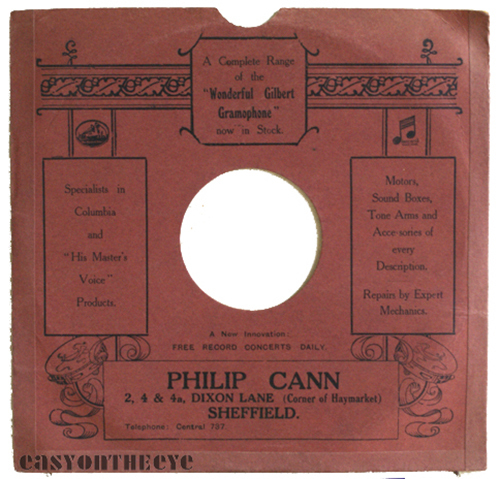 Cann Ltd. Philip. Chapel Walk, Fargate. 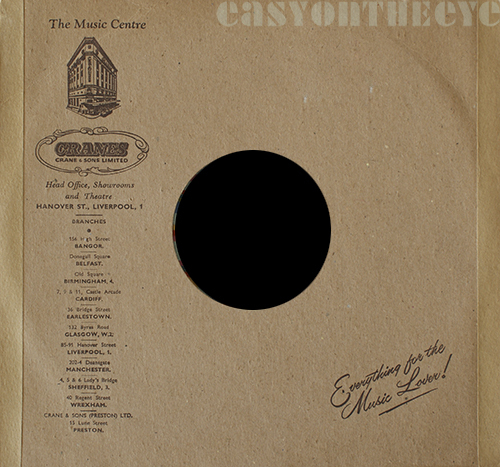 The business moved to new store C1959, with a large record department, listening booths, etc. in the basement. 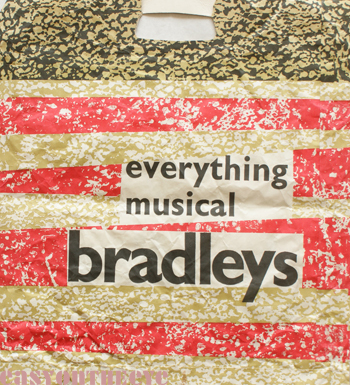 Above is a 7″ paper bag from the new store, C1960. The business was sold by Philip’s three sons when they retired circa 1968, and bought by Vallances, a chain. They agree to keep the family name for five years until 1973, then renamed it Vallances. They were an electrical and white goods chain and the shop quickly went downhill after they fired the Canns manager. It closed in 1976. Shop building is still there but divided up internally. Vallances also had a shop on The Moor later but with just a tiny record counter. 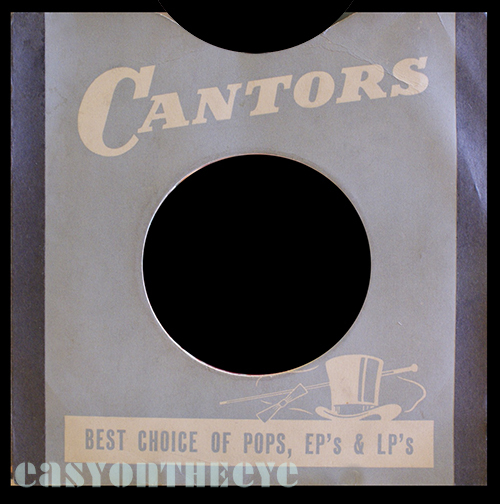 Canns have a fuller entry on the site with more photographs. 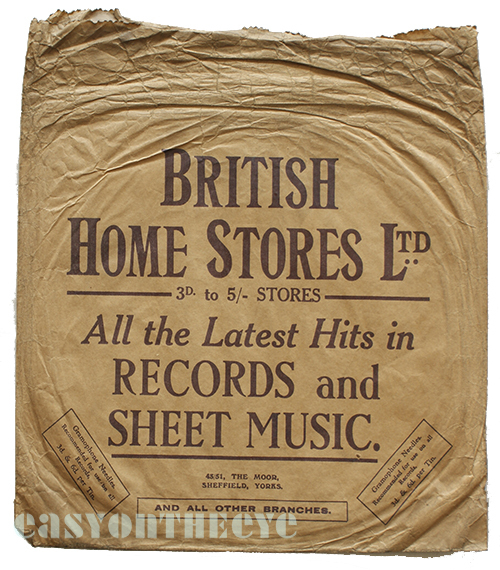 Below; the shop did a tie up with the Sheffield Morning Telegraph to promote the record review column on clear plastic album bags. 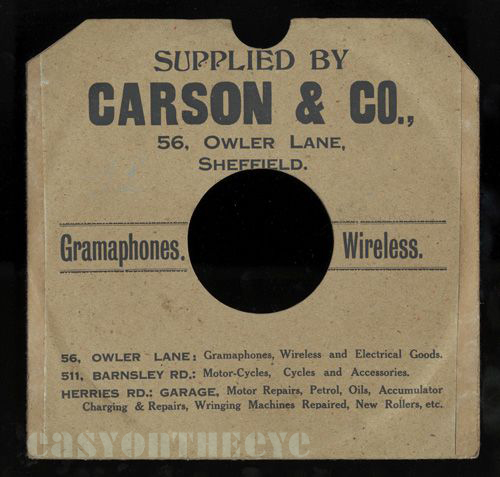 A local business with three premises, one selling motorcycles and bikes at 511 Barnsley Road, a garage on Herries Road and the electrical goods shop at Owler Lane, early stockist of records or “Gramaphones (sic), Wireless and electrical goods”. 56 is still standing, but used as offices. 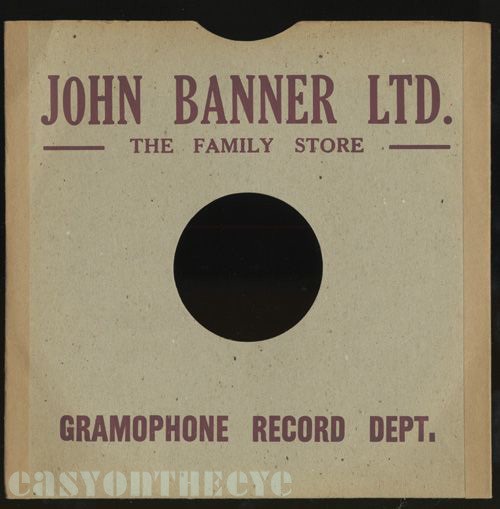 Sold 78s, “Gramophone Records / Gramophone Players + repairs. Accumulators [batteries] charged.” Area demolished and rebuilt as new housing. 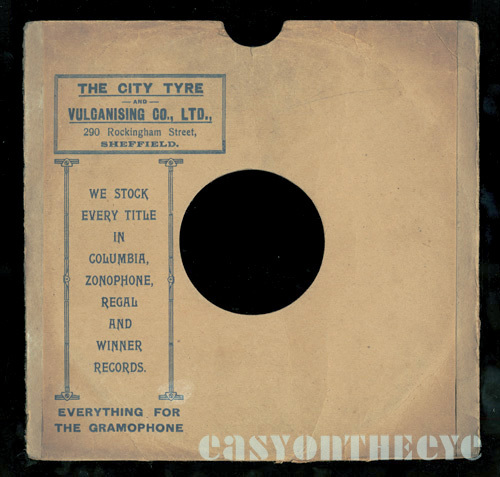 It might seem an ususual sideline for a car tyre and rubber business to us (though probably no weirder than garages selling alcohol would seem in the 1920s), but they sold 78s for a time and “Everything for the gramophone.” Area now redeveloped. A popular local city centre department store on Angle Street, Cockaynes opened at a drapers in 1829 and was a full department store by 1899. The building was destroyed in the blitz but rebuilt after the war between 1949 and 1955 (when the final floors were added.) 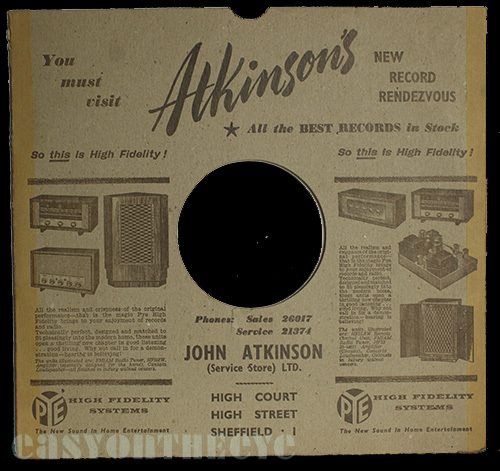 Like many shops they had their own record department at least by the 1950s selling 78s, and then singles. 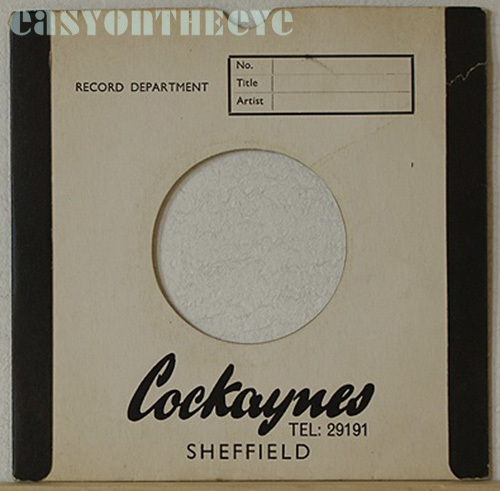 Eventually printed up ‘master bags’ to keep track of titles in stock as above, but before that the company name T B & W Cockayne was just rubber stamped on the sleeve as below. 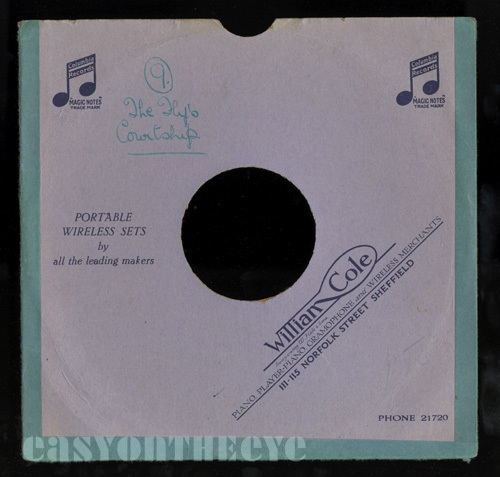 We can date this to 1958 as the writing in the corner gives the catalogue number for an EP by Les Compagnons De La Chanson, a French group who issued a 4 track EP that year sung in English. 5/- to you (25p). 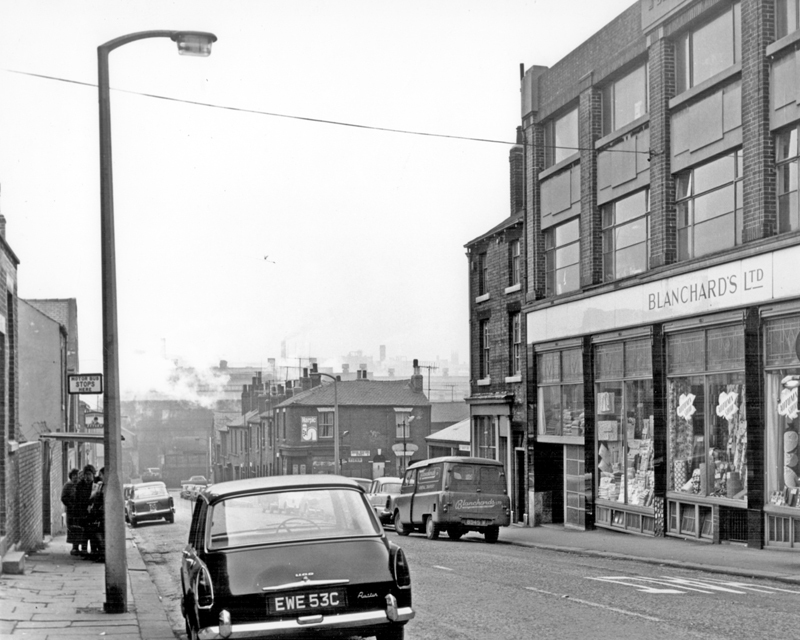 The shop was taken over by Schofields in 1972 but closed ten years later. Premises still there. I assume the Co-op sold records from some of their bigger stores in the city, the above being two which did 78s before the war. 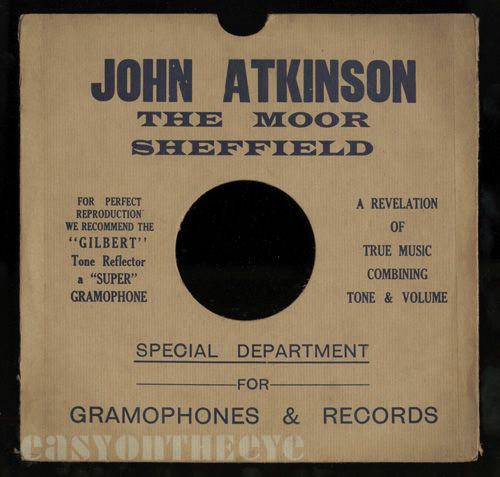 “Piano, Player-piano, Gramophone and Wireless Merchants.” (Sheffield & District Trades Directory 1927-28). I think they were a separate business to the better known Cole Brothers shop (see below). 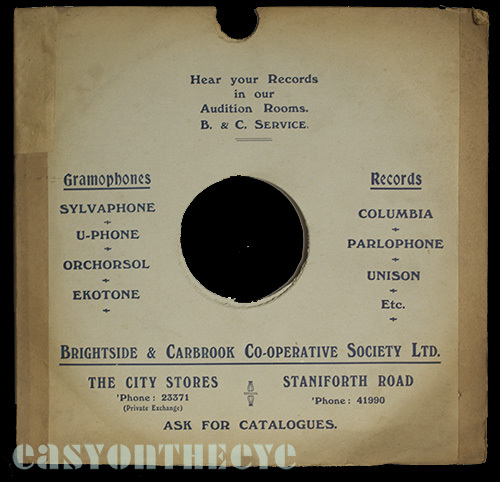 “Visit our Gramophone and Record Department downstairs and hear the latest music”. A local business dating back to the mid-1800s established by three brothers, Coles became part of the Selfridge chain then John Lewis. Coles corner was famous locally as a meeting place (and inspired a Richard Hawley album title). Coles moved to the purpose built new store in Barkers Pool in 1963. The original building, reportedly one of the first iron framed buildings in the country, was demolished in favour of one of the blandest modern buildings in the city (which is saying something). Primarily an electrical goods shop which also sold 78s and later albums and singles, “For All The Best Records”. Shop closed C1964. Probably demolished. Listed in the Sheffield & District Trades Directory 1927-28, Crane’s probably has a much longer history, starting as a music shop in Liverpool and then expanding across the country. Still listed as Record Dealers in 1965 directory I vaguely remember them but they’d moved to more modest premises in a more central location (advertised as selling Pianos and organs. 1973 Kellys). The 78 sleeve lists their various stores. “Everything for The Music Lover”. The Ladys Bridge building is still standing, now listed. Curtis, F and Sons, W H.
This Sheffield chain of electrical retailers and record shops began at least as early as the mid-1920s on London Road (moving at least three times there). 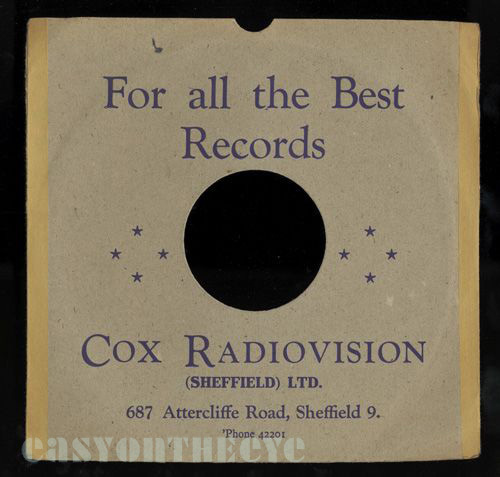 The the 1930s they were advertising record bars in their shops at 1 Porter Street, Moorhead; 68-72 London Road; 253 Crookes and 669 Chesterfield Road. They opened a new Moorhead shop at 5 The Moor around 1959. This finally closed in 1973. They also had shops in Doncaster, Derbyshire and Nottinghamshire at the height of their business. Curtis also operated some sort of recording studio facility before the war. 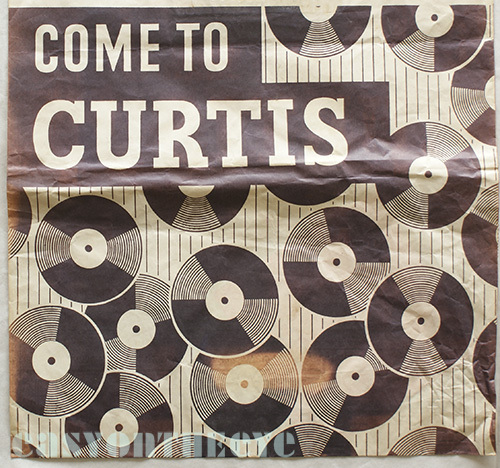 A detailed entry for W H Curtis is on the site. I think I have one of H Smith the Phono King Norfolk market. Feel free to share any not shown here! My uncle William Reade bought a piano from Crane & sons Ladysbridge, Sheffield in 1931. I still have the invoice and payment book if anyone is interested. It was a lovely piano, my uncle took pupils and was friendly with Al Bowly, a well known crooner killed in the blitz. Thanks for this Barrie; the local history library might be interested in your documents if you wanted me to pass them on.